The global gas market is not in free fall, but it has started to sink, with summer 2019 delivery prices down below 7.0 $/mmbtu. The consistent story of a warm NE Asian winter is now joined by a projected warm first half of February in Europe, resulting in flat prices falling and global spreads narrowing. By contrast, the northern US market has seen more extreme cold so far this winter, with Midcon markets and NE hubs seeing most of the upward price movement as a result. Although these regions could potentially compete for Cove Point feedgas, the days of spiking prices have been few and far between, with only limited evidence of Cove Point gas sold back into the local markets so far this winter. Some conflicting weather patterns and high NE Asian stocks have helped to start resetting global price levels and narrow global spreads. With February weather forecasts for milder weather to remain across the major NE Asian buyers, the region will continue to see weak demand. As such, NE Asian LNG stocks will remain strong, and shoulder-month restocking demand should be light. With another six weeks or so of winter left, the Q2 19 JKM strip has already dipped below 7 $/mmbtu. With supply continuing to ride the crest of the LNG liquefaction wave and January posting sequential supply gains of some 2.8 Mt m/m, buyers are looking far more bearish than sellers, with the JKM bid-offer spread being put at some 60 cents. Even with Europe in the midst of a peak winter cold spell, the TTF/NBP has offered little support to global prices. Rather, the incremental LNG supply coming into EU regas facilities combined with good pipeline volumes has meant that EU gas storage inventories ended January some 4.4 bcm higher y/y. With such healthy inventories and the summer promise of more LNG, the TTF spent most of the last five trading sessions selling off. This has taken prices, while still reasonably high in absolute terms, down to some very low relative levels, with even cash prices failing to move on some much colder-than-normal temperatures. While some of the end of last week’s precipitous softening was down to weather forecasts that suggested a much warmer first half to February, the market had been soft even when facing a colder-than-normal month. As per usual, the NBP has held out around a 1 €/MWh winter premium to the TTF, with that premium standing up well over the last month given how little storage capacity the UK has now that Rough is closed. What that has meant is that the UK remains a favoured location for cargoes coming into NW Europe, with the UK taking 1.2 Mt in January, some 40% of all the cargoes received in the region. A move into warmer temperatures has seen that NBP-TTF spread narrow sharply, moving the continent and the UK gas markets onto a more equal footing. Cove Point – selling local? Winter has also been delivering cold weather to the US market, with Midcon markets experiencing another polar vortex. Despite the US freeze being much more extreme than Europe’s cold spell, the US gas market response has been somewhat muted, with even the regional NE hubs seeing unexceptional basis uplift to Henry. As such, the spreads between the global benchmarks (JKM to TTF) have started to narrow from the peaks recorded back in Q4 18. With the spreads narrowing, and the extreme cold in the northern US, there are questions being raised as to whether Cove Point exports will start to be affected if the short-term arb window closes. Among the operating US trains, Cove Point is unique in that it is geographically close to demand hubs that can compete for its feed gas. As such, the price paid for gas sourced in the Marcellus is not the relevant metric. Rather, it is the price that is paid for the gas at the competing demand hub of Transco Zone 5 (TZ5). At last Friday’s close, the TZ5 was around 3.85 $/mmbtu, which puts an opportunity cost for a Cove Point FOB price of around 4.4 $/mmbtu. With transport to Asia now around 2.1 $/mmbtu, putting delivery to the JKM at 6.5 $/mmbtu, vs only 0.9 $/mmbtu to NW Europe, thus 5.3 $/mmbtu for delivery to the TTF/NBP, the arb windows with both destinations are open, although the netbacks favour Europe. Over most of the winter, those arb windows have been open and have led to a continued flow of feed gas into Cove Point. 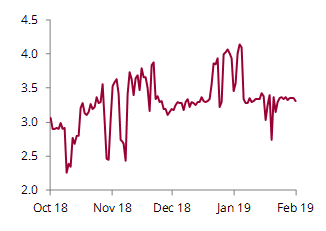 The first time when feed gas appeared to be sold back into the TZ5 market was 21 January, when TZ5 cash prices were above 7 $/mmbtu, but the selling only lasted for a day and a half. With no reported pipeline interruptions to firm capacity at that time, that strong price movement emerged on 18 January, which would have closed the arb, although the Cove Point shippers responded accordingly only a couple of days later. With the latest cold spell also delivering a short spike on NE US hub prices, some apparent selling occurred around 29 January when prices went back above 7.5 $/mmbtu—more closely aligned with the price signal. 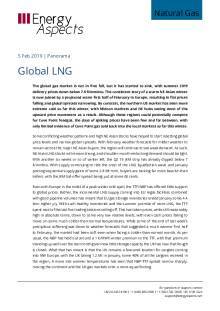 However, outside of the peak winter spikes, even the softness in the global markets is unlikely to match summer softness in the NE US markets, so LNG exports look set to continue uninterrupted from Cove Point for the coming months. Sticking with the US projects, the pipeline flows into Sabine Pass are giving only a sketchy picture of whether all five Sabine Pass trains are actually working. Flows into the facility for the last three weeks have been fairly constant at around 3.4 bcf/d, which is around nameplate for all five 4.5 Mtpa trains. While this suggests all trains are on, the facility has had previous sustained periods (in October and early December) when it was taking that much gas and which pre-dated indications of when T5 would have been coming online. Also, from late December to early January, pipeline flows were up around 4.0 bcf/d. With Sabine Pass trains able to produce above the volume of the ‘approved’ export capacity (up to 4.9 Mtpa according to Cheniere investor reports), current levels do little to confirm if T5 is actually producing. In an early January investor call, T5 was put at 98% complete. While vague, this suggests that even if it was finished it would not be producing that much LNG. 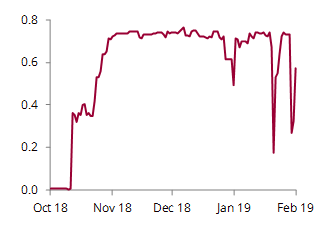 Meanwhile, Corpus Christi T1 has demonstrated a fairly typical commissioning cycle of ramping flows up and down, but for the last two weeks or so it had been taking nothing, with flows only gradually restarting yesterday. While this could be the final check prior to it heading up for a more sustained period of baseload operation, it is worth keeping an eye on for when exports from the plant might restart.